Published online on August 14 in the Journal of Biological Chemistry, the research entitled "A kidney-specific genetic control module in mice governs endocrine regulation of the cytochrome P450 gene Cyp27b1 essential for vitamin D activation" utilizes new mouse models created through CRISPR gene editing technology to identify this regulatory feature of the gene. These mouse models will also allow researchers to investigate more thoroughly not only advanced basic concepts, but to explore specific human diseases caused by errors in the vitamin D activation pathway. "Hector DeLuca famously discovered the active vitamin D metabolite in the early '70s, building upon what his mentor Harry Steenbock had done several years before him," Pike says. "He discovered, among other important findings, that vitamin D needed to be modified in the body to more active forms, and that this conversion was regulated by hormones, including the dominant regulator parathyroid hormone (PTH). Beyond this, we really had no idea mechanistically how any of these hormones that regulate vitamin D activation actually worked. This molecular depth is important, because if you want to perturb the synthesis of the vitamin D hormone therapeutically in the future, you have to delineate and then understand the molecular steps that are involved that govern its production. And that's what we've done." Interestingly, while it was thought that the active form of vitamin D was produced only in the kidney, research in recent years has shown that many different cell types—skin cells, skeletal cells, immune cells, just to name a few—are able to make very small amounts of the hormone also. So, numerous questions arise, including how this local production influences the activities of the hormone in target cells and how this is accomplished mechanistically? 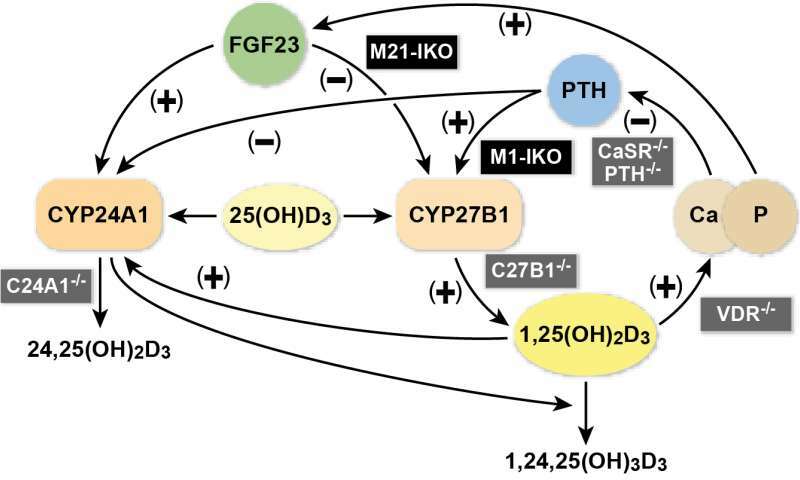 The answer appears to be that there may be two general spheres of vitamin D influence in the body, due largely to the fact that the regulation of calcitriol production is different in the kidney compared to diverse distant cell types: the first is calcitriol's actions to regulate mineral homeostasis controlled largely by the hormones' production in the kidney, and the second is calcitriol's actions in these distant targets where the hormones' local production controls biological activities unique to the cell type and unrelated to mineral metabolism. Having created mouse models in which these sources of calcitriol can be controlled separately will allow researchers to understand the interactions that occur between the two sources and to understand the impact of vitamin D on these two biological spheres of influence. "What this means in human disease is that it opens doors to studying how to better direct treatments," Meyer says. "If researchers on the clinical side were, for example, interested in seeing if patients harbor genetic defects that prevent them from improving someone's calcitriol production to perhaps help immune function or blood calcium levels that could be beneficial to disease progression, this is the kind of information they would need." The team's mouse models are unique because rather than using gene editing to knock out the gene for the enzyme—called Cyp27b1—responsible for the final conversion of vitamin D in the kidney, the researchers instead manipulated genomic enhancers, pieces of DNA outside gene coding regions that activate and repress expression of the Cyp27b1 gene, but only in the kidney. In the study, when the researchers turned down the expression of the enzyme that makes the active form in this organ, it had a profound negative effect on the mouse, particularly the skeleton. "The biology of vitamin D is constantly being furthered, but our work on this regulatory aspect really represents the last mechanistic component of the vitamin D puzzle," Pike says. "We have pried the lid open on this one just enough now, so that future work is likely to lead ultimately to a firmer understanding of how the vitamin D hormone is produced and regulated, and how the diverse biological sources of the vitamin D hormone complement one another in controlling complex biological output. Now that the lid's been lifted, it will be exciting to look inside and see what really is going on."